When I found out I was pregnant with my first child, as any parent, I did so many things to prepare for our daughter’s arrival, but as a bilingual mom-to-be, I conscientiously prepared for being the primary Portuguese speaker in her life. Even with all of the preparation of reading blogs and books about bilingual parenting, building a library of children’s storybooks in Portuguese, and relearning children’s songs from my childhood, I naively thought it would be easier, that as long as I spoke only Portuguese to my children from birth, they would easily become Portuguese speakers and would naturally choose Portuguese as our language of interaction. When my son arrived about 1.5 years later, I excitedly thought to myself, “Yay, we’ll have another Portuguese speaker in our home!” The unfortunate reality is that even in the midst of my efforts to keep Portuguese central and constant in our lives, they still favor English, which is my husband’s and our community language. What’s even more bewildering is that for my daughter, who’s older and has more advanced language skills, if I ask her if she’s able to say in Portuguese the English utterance she just made, she can do it most times without any difficulty. So I’m left with the puzzling question, if she clearly has the Portuguese language base, why didn’t she choose Portuguese in the first place when I’m speaking to her in Portuguese? I never imagined that the majority language giant would be so large, so difficult to overcome. I didn’t realize my competition with him would be so fierce, so constant, so exasperating. Many days I feel like a little insignificant gnome trying to guard this minority language treasure that I hold. The majority language giant is everywhere I look…in all public places we roam—the library, the playground, the grocery store, the mall, play dates with friends, church, the skating rink…simply everywhere! This giant is so present, so powerful that he even attempts to take over in our home on television, on the iPad, on the radio, in storybooks. So here I am, this tiny minority language gnome always seemingly on the losing end; the odds constantly against me in this intense competition for relevance, input, and need. And to make matters worse, I confront the quandary that the majority language giant is equally needful…such a love-hate relationship exists with this giant! Are you feeling hopeless in the battle with your majority language giant? Well, here’s the good news. Instead of accepting defeat, here are some strategies that you might try. As a trilingual speech-language pathologist, these strategies are geared for children with language disorders, but as a bilingual mother, they work beautifully with typically-developing children learning more than one language because of the scaffolding and structure they provide. There are many language facilitation strategies in my field, but the ones described below are the ones I employ most often with bilingual children: Narration, Expansions, Recasts, and Choices. Think of the word “nurture” and the acronym abbreviation “NERCh” as you learn and practice use of these strategies. Some of these strategies may overlap or be used simultaneously. Narrate or talk through and about the things you and your child are doing, seeing, hearing, smelling, tasting, feeling (keep the five senses in mind!). The goal here is modeling ample vocabulary (number of words and a variety of words used such as nouns, verbs, adjectives, etc.) and correct language use (appropriate word order and grammar such as pronoun use, verb usage, prepositional phrases, etc.). Live narration has been described as a verbal “play-by-play” description of what is going on around you. In summary, narrate all of your parent-child interactions in the home language (i.e. conversing, playing, reading, singing, drawing, cooking, feeding, dressing, bathing, bedtime routine, going out, shopping). It’s easy to just go through these activities without much verbal output, so talk, talk, talk! You might notice your child will subconsciously begin narrating his/her experiences and happenings, and if you notice them trying to utilize the minority language but struggling, you can employ additional helps such as giving them the first sound or the first syllable of the word, or simply teaching them the word on the spot. One thing I love that my children do is, when they hear me using a word they don’t understand in Portuguese and can’t grasp meaning from the context of our conversation (maybe a word I don’t use often or a new word they’ve never heard), they’ll directly ask me what that word means. I can then directly teach the new vocabulary. The goal here is to recast or present your child’s utterance (which was partially or completely in the majority language) in a changed structure (in the minority language) while maintaining its meaning. For example, if my child would utter a phrase or sentence partially or entirely in English, I would recast that utterance in Portuguese, modeling correct usage where any lexical or grammatical gaps were noted. As you use these purposeful strategies as needed, keep your verbal interactions naturalistic (not forced). With practice, you should notice these language building strategies will become a natural part of your interactional style. Keep them in mind as you make day-to-day decisions about interactions, activities, and opportunities for engagement in the minority language and culture. Click here for a handy PDF of these four “NERCh” strategies, to print out or share. I am often asked, how do you get your children to respond in the minority language? Do you force them to do it or to repeat themselves in the minority language? When my children default to the majority language, sometimes I may ask them to repeat the utterance in Portuguese after giving them a model. Occasionally I may say in Portuguese with a puzzled look on my face, “I don’t understand English today.” Most of the time though, I believe the most important thing I do is this: I simply keep speaking the target language. It would be easy to respond in English, and it often takes conscious effort to remain in Portuguese, but in the end, it’s the most productive effort I can make to foster my children’s growth in our bilingual journey. Finally, let me offer a word of caution for eager bilingual parents: Although language learning is important, it’s not more important than having healthy and loving relationships with our children. Language learning should never be a source of pressure, fear, shame, anxiety, embarrassment, anger, irritation, or disappointment. Language is about communication—interacting, engaging, and connecting with people—so it should be an experience that brings pleasure and joy in relationships. What your child has to say is more important than how he/she communicates it (i.e. the language he/she uses), so we must always demonstrate that we value their words (thoughts, opinions, conversation) more than their delivery. 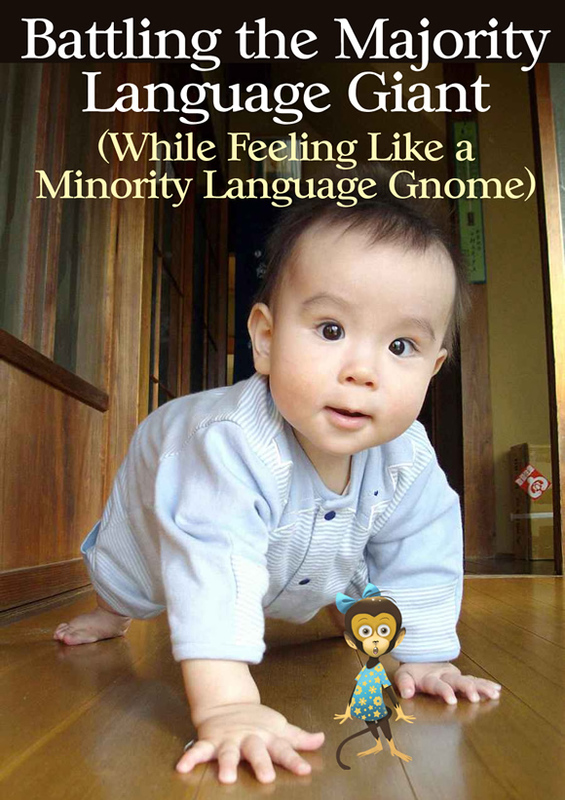 We, as minority language gnomes, must find fun and creative ways to encourage minority language use in our endless battle with the majority language giant! I’ll share with you the latest thing I’m preparing to try. I’ve purchased 7 small balls: 2 yellow and 2 green to represent Brazil/Portuguese, and 1 red, 1 white, and 1 blue to represent the United States/English. The balls will all be placed in a dark drawstring bag, and either every day or on random days, the children will be choosing their language of “responding.” I’ll begin using the language selection or “talking bag” with specific activities throughout our day, and then I’ll move to the language of responding for the entire day. When yellow or green balls are chosen, I’m preparing some visual cues and extra supports for them to feel successful choosing Portuguese even when their tendency or default is to choose English. I want to minimize any frustration or feelings of inadequacy due to the potential challenge. One visual cue is necklaces I made showing the Brazilian flag using small and thin rectangular wooden boards and heavy string. The same could be done with laminated index cards. The bearers of the necklace must attempt to use that language at least 90% of the time. I saw this used in a second language learning classroom and it worked really well! Ana Paula G. Mumy is a mother of two bilingual children and a trilingual speech-language pathologist (SLP). She’s also the author of multilingual leveled storybooks and a practical parent guide for raising bilingual children. She has provided school-based and private services for 15 years and thoroughly enjoys providing resources for SLPs, educators and parents on her website The Speech Stop. Don’t miss Ana Paula’s other popular guest post Speech-Language Pathologist Tells All About Bilingualism, Speech, and Language Delays. How about you? What tricks have you tried to encourage your children to use the minority language? Ana Paula, thanks again for writing another really helpful post! Let me just add a couple of ideas about encouraging use of the minority language by reluctant monkeys. The success of these strategies will naturally depend on the particular parent and child, but they’ve worked well for some families. For older children who are capable of communicating in the target language, you might get them using it more actively by establishing the “rule” that they must use this language for all requests. If the “wrong” language is used, you don’t respond. This sort of tactic, if successful, could help pave the way for more active use of the language in general. If the child makes a request in the majority language, you could respond, but very, very slowly, like you’re moving in slow-motion. If the child wants you to respond more quickly, the target language should be used. Do this tactic playfully, like a game—responding very slowly on one hand and very quickly on the other—and it can help activate the minority language. This is really helpful. It turns out I’ve been recasting and expanding with my would-be bilingual twins for a long time, and recently spontaneously started to narrate, having decided I needed to support their minority language some more. So good to have names for these, and confirmation of their effectiveness. The choices idea is new for me though, and I’ll try it immediately! James – You are absolutely right in that we often employ these strategies intuitively! Best to you as you continue on your bilingual journey! Thanks so much for your post. I feel the same about my battle against the English giant. I am raising my children trilingual (with Romanian, German and English) living in the US. We employed the strategy of one person one language (dad English, mom Romanian and au pair German). Without having so much structure in my approach, I am probably doing a lot of the strategies you are quoting here. For smaller kids like mine (ages almost 3 and almost 1,5) I have to keep asking them: how do you say it to mommy, how do you say it to Annca (our au pair). At this age, my 3 y.o. does not necessarily know the difference between languages but she knows exactly the difference between how she speaks to one person vs. the other. My almost 3 y.o. is trilingual but like everyone one else the English giant is always threatening us, the Romanian and the German dwarfs. I love seeing everyone’s experience and will keep reading this blog. As I am currently writing my master thesis on bilingual/bicultural children, I am finding out that one of the most important things to succeed in raising bilingual children is the support the majority parent gives to the minority language. I can elaborate on this if people are interested. Alina – yes, your point is so valid – the support of the parent providing the majority language input is extremely important! My husband has been my #1 supporter, encouraging me along the way when I feel overwhelmed, trusting me (and giving me the freedom) to purchase the resources I need, and most importantly, being willing to be “lost” at times in the midst of interactions that are taking place in Portuguese. I try to translate for his sake often, but there are times when it’s not feasible or beneficial. The bonus I find now is that, after 6 years of hearing Portuguese in our home, I need to translate for him less and less! I’m facing the same challenge with my 20 month old son. I noticed that some words that he used to say in Portuguese he has stopped saying them and what’s worse he has replaced them with English equivalents. For example he doesn’t say “tchau” anymore just bye bye. Do you have any tips on that? My husband is American and doesn’t speak Portuguese so I feel exactly the same as you. I wish he would learn Portuguese but it’s way too complicated for him. Our main struggle is when we are all together and 100% of the conversation needs to be in English. What do you do? Because that feeds the giant big time. Oi RW – In our family, I still avoid using English even when my husband is present, so I end up doing a lot of translating. If English is necessary, I will preface what I say with: “Mamãe vai falar em inglês pra daddy entender” (Mommy is going to speak English so daddy can understand). I do this to keep establishing the fact that our primary language of interaction is Portuguese. I want them to continually view English as not part of the “norm.” It’s a struggle for sure! The one thing I would recommend is resist the temptation to switch to English, even when he is initiating or responding in English. That is the moment when I see many parents give up or give in to the majority language pull. I have some additional resources on my personal website, so take a look when you have a chance. I hope this helps! Hi Anna Paula, we are in a similar situation ourselves. While my husband is not necessarily proficient yet, he is becoming more comfortable. How about school in the majority language? How did you fight this giant? I am afraid they will lose their abilities in Romanian since I read school is such a crucial environment for them (learn things, make new friends, etc). How did starting school in the majority language affect your children’s skills in Portuguese? Alina, I’ll alert Anna Paula to your question. Let me just share the link, in case you haven’t seen it, to Do Your Bilingual Children Go to School in the Majority Language?, which includes additional links below it. This article, and these other posts about schooling in the majority language, may be of some insight and support. Alina – I chose a somewhat challenging path for fighting the “school in the majority language” giant…I am homeschooling my children bilingually. I recently wrote an article in detail addressing this (http://www.multilingualliving.com/2015/04/08/teaching-my-children-to-read-in-two-languages/), but in short, my children are enrolled in an online charter school for the English curriculum (I am still the primary teacher, but I serve more as a facilitator of the online lessons, and there’s still less English exposure since we’re home), and I purchased a reading, math, & science curriculum in Portuguese for 1st through 5th grade. I have taught literacy in Portuguese first and then moved to English…so far it’s working very well. They also meet with a teacher from the charter school about 2-3 times monthly. I’m not sure if I’ll continue homeschooling through 5th grade, but I feel my children will need at least 3 solid years of homeschooling in order to get a strong foundation of Portuguese phonics, Portuguese grammar, etc. Thanks for the advice, my son seems now to understand more and more of what we are saying to him and I try to “smuggle” as much of my minority language as possible. Very useful article (except the part where a strategy becomes a mother, just a logical error in sentence 😉 )! Next post: How Do You Spell B.I.L.I.N.G.U.A.L. ?